Peace and happiness through crafting. 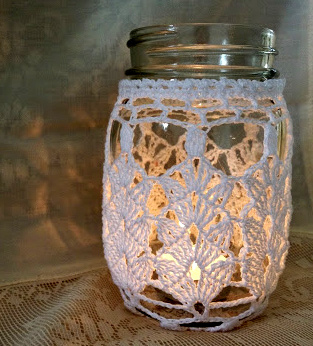 I’ve taken a short break from frantic slipper-making to indulge a creative whim: designing thread crochet candle holders. Well, they’re actually Mason jar covers, and I hope to use them as pendant lamps. 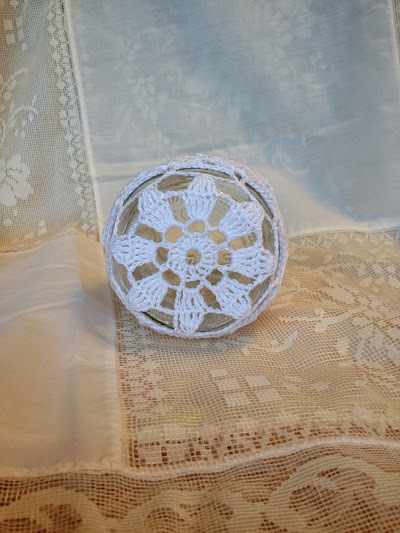 Equally gorgeous as tea light holders, these covers are basically cylindrical doilies. I’m fascinated by the interplay of light and shadow created when it’s lit from within by a candle. Light up your home this holiday…also, DIY wedding alert! 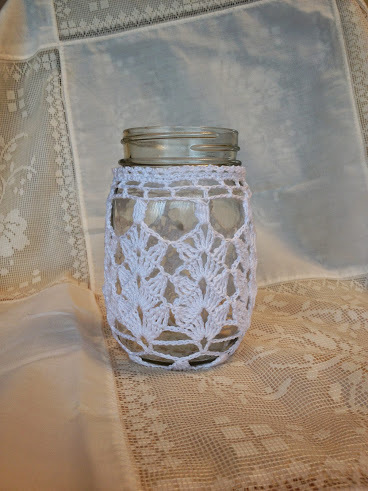 This is my latest design: the Foxgloves Lace mason jar cover. The base of the cover is a floral design, making it perfect for a hanging pendant lamp. Anyway, if you’re planning a DIY wedding, get started on these now! You can make a bunch for centrepieces or favours. The pattern is available for sale in my Etsy shop and also on Ravelry and Craftsy. 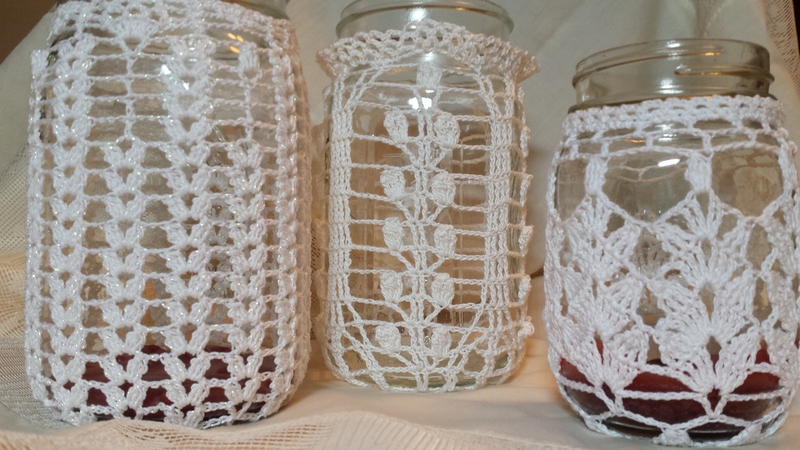 Since I first wrote this, I’ve written two other mason jar patterns. You can purchase them individually or as a collection (save 25% off individual prices by purchasing the collection). The collection is available in my Etsy, Craftsy, and Ravelry stores. On Ravelry, add all three patterns to your cart and the discount will be calculated automatically. Etsy and Craftsy have a separate listing for the pattern collection. Peppermint for the holidays and a new pattern! This year, I’m in love with a Nordic-look red and white theme. 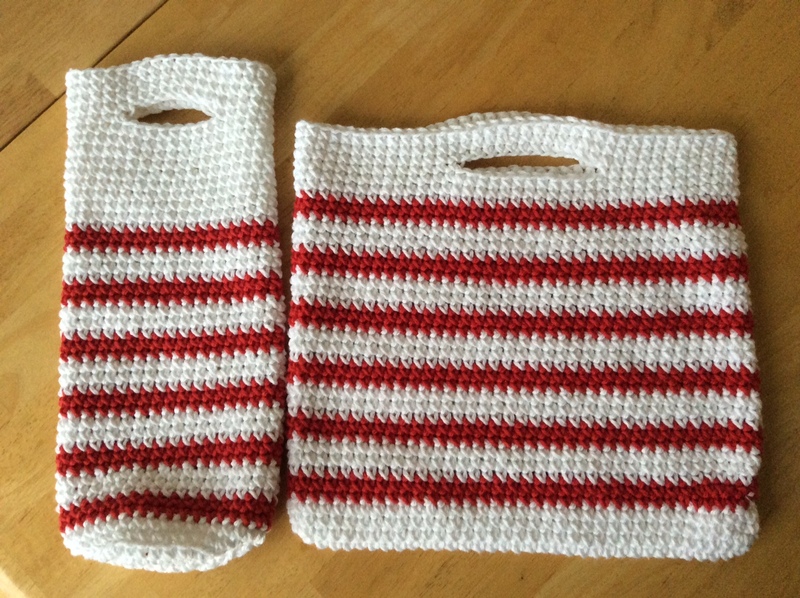 I’m working on decorations and gift items with these colours – bright white and real red. Here are the first items in my 2014 holiday collection: the Peppermint handbag and wine bottle carrier set! The pattern is available in my Etsy shop and in my Ravelry store. You can make them both in a weekend using less than three balls of Lily Sugar’n Cream cotton.